Will you look at these Championship Trophies? 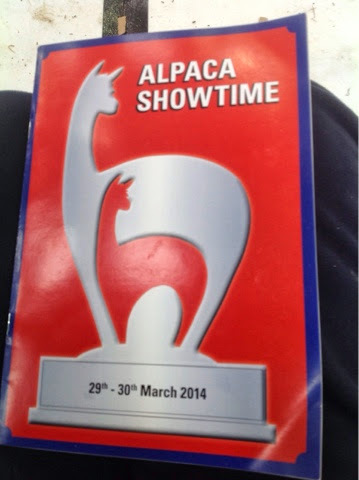 Whoever designed and had these made has achieved the best looking alpaca trophy I have ever seen. And believe me I've seen a few. You see them and you want one. They're a must have. They make you want to enter the show just to see if you could get one to brighten up your trophy cabinet. You'd want to use it as a bonnet mascot for your car on the drive home they are that impressive.They are so good that those people who won championships at the weekend should rent them out to those of us who missed them by a whisker. Well done to whoever designed and made them and well done to Houghton Hall, Bozedown and Alpaca Stud for coughing up the readies to make them so attractive. They now set a marker for a more impressive alternative because you certainly couldn't copy them and get away with it! When your birthing starts mid April and you get to see this years improvement we shall all be hoping for a Champion to compete for the Alpaca Showtime bling!! We had the Toft Team out again this weekend at Houghton Hall alpacas where Mick and Liz George of Houghton Hall Alpacas hosted the Alpaca Showtime halter show in their enormous Equestrian centre. 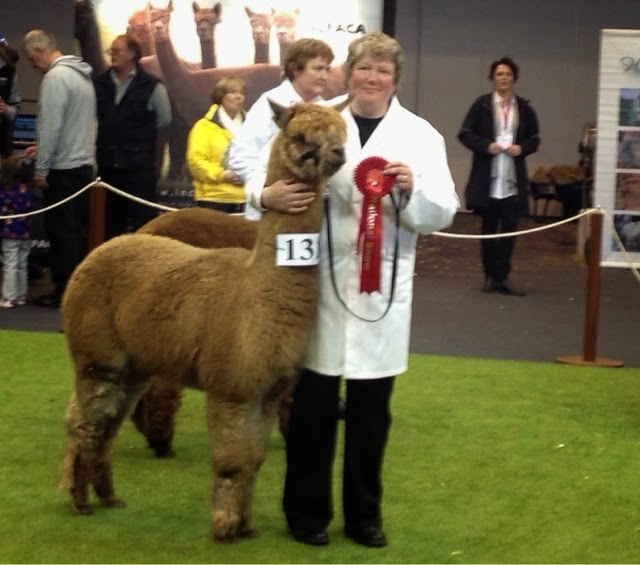 Australian and AOBA Judge Peter Kennedy was ringmaster and judged over 275 alpacas through the two days. Organised joint by Houghton Hall alpacas, the Alpaca Stud and Bozedown alpacas the event ran like a Swiss watch and much fun was had by all. 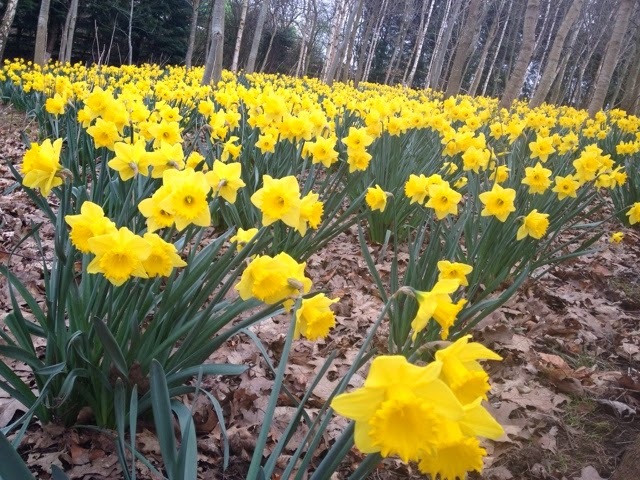 Much thanks from Toft to Mick & Liz George of Houghton, Mary Jo Smith of Bozedown and. Nice Harrington Smith of The Alpaca Stud and their respective teams of helpers for the immense amount of work they put in to get this new alpaca event up and running. It's a great Equestrian facility which I'm sure will stage many stunning alpaca events in years to come. As for Toft well we took six alpacas along and everyone came home with a rosette. We achieved 1 first, three seconds, a fourth and sixth in the individual classes and Toft Timogen was awarded Reserve Champion Brown Male which compliments the Champion Brown Male he won at the BAS National Show two weeks ago. All in all another great weekend of Alpaca Showing for Toft and much thanks to our herds woman Linda Newport for making us look as good as possible in the showring. There they go marching in battalions and regiments right across the gardens of England. All we need now is a little of the warm stuff so we can enjoy them rather than offer them a passing nod. Lovely show mind for the visitors to the Toft Alpaca Shop. Wow! I first saw this event in New Zealand at their National Show around 2008 in the young peoples arena. Then again when I judged the Yorkshire Alpaca Group Show in Thirsk a couple of years ago. Now here we are with it centre stage at the BAS National and I have to say it remains the biggest crowd puller of the weekend. The people were four deep around the ring to see Harry Potter and the Unicorn, Batman and Robin and the Princesses strut their stuff during the lunch hour. The crowd vote for the winners with a show of hands and fantastic appreciation and encouragement was shown by the general public and the UK Alpaca Breeders for this unique and fascinating distraction. A fantastic amount of effort was put in by all the entrants and I should imagine hours of fun were had in preparation for this event. 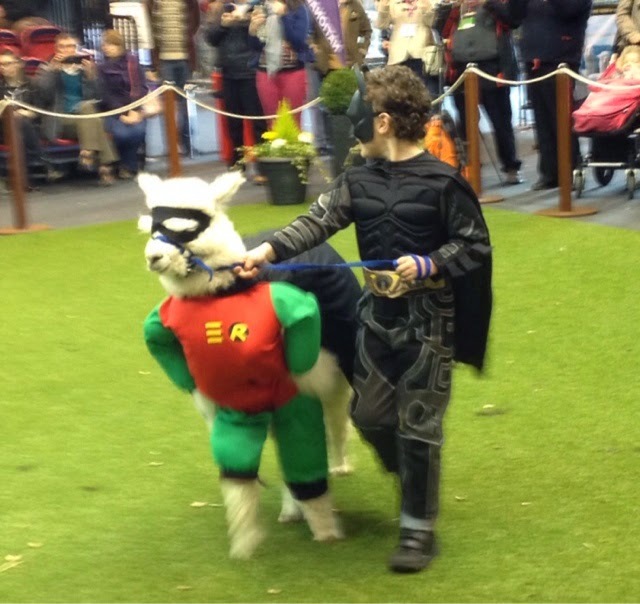 Although Batman & Robin came out the winner, everyone was truly a winner and the alpacas seemed to love it. The entrants obviously pick their favourite pets, acclimatise them to the costumes and must spend some hours performing in full cossy to get them to be so settled. It's fun, challenging in its preparation and certainly a wow with the crowds and the young handlers who took part must have found it a rewarding experience. 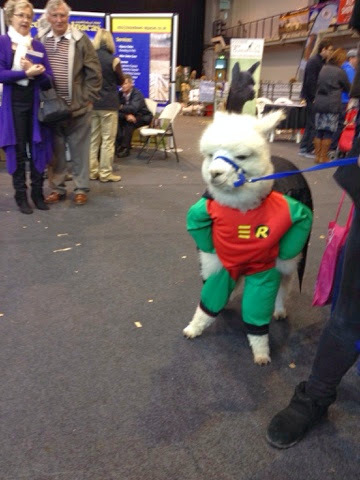 Personally I have never liked dressing up in fancy dress myself but as an alternative alpaca entertainment I love it, as long as it is well done, enjoyable for alpaca, exhibitor and crowd alike I believe it emphasises the 'show case' element of our industry and certainly must appeal up those who adore keeping these wonderful creatures as pets. 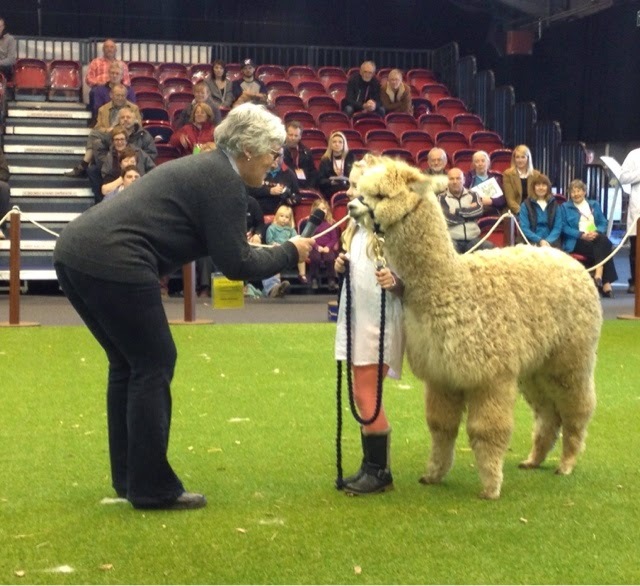 Let's hope that more families take up the challenge for 2015, and make this a fantastic alpaca spectacle. 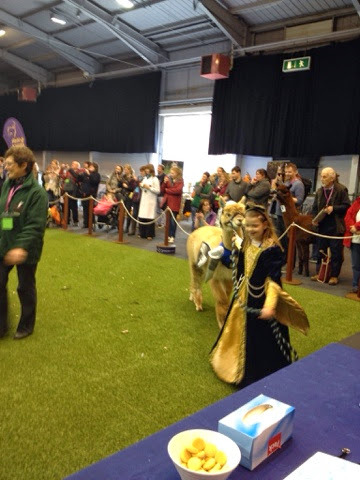 A huge thanks on behalf of us all to the exhibitors and a special thanks Julia Smith of Astonishing Alpacas who did a great job in organising this event as well as supervising in the Young peoples area for the BAS National. There always seemed to be plenty going off in there everytime I whizzed past. And the weirdest image of all was when I caught 'Robin' with his mask off -Spooky or What? In a welcome break for the judging of alpacas the young handler competition was held on the Saturday lunch hour with two separate classes, one for the young uns 3-7 and another for the older handlers 8-15. 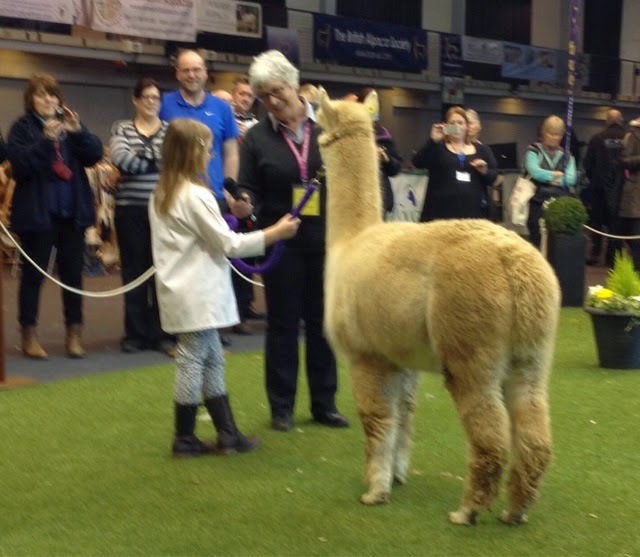 Shirley ran the younger class and Tim Hey from Inca Alpacas the older one. 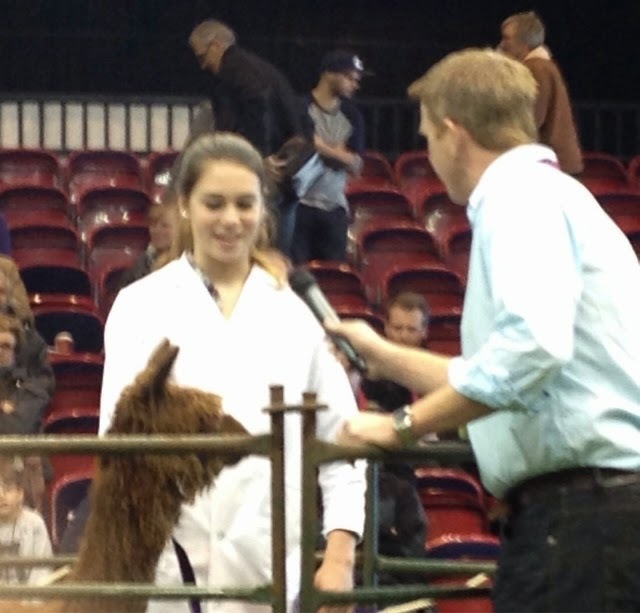 It was refreshing to see that all of the entrants knew their way around alpacas. 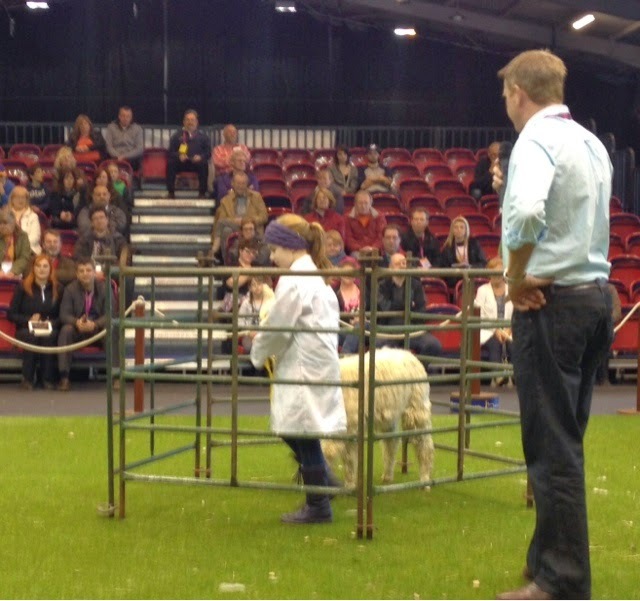 All competitors walked and handled with confidence and with very little prompting even the youngest managed to answer intelligent questions on alpacas. 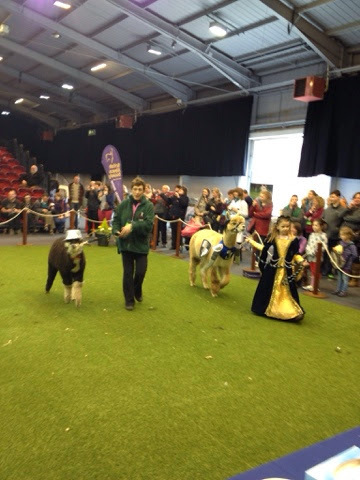 Sometimes it's the cute factor which governs the winners and I must admit it was nice to see several first prizes handed out to the under 7's but the older handlers had to strut their stuff in style and be knowledgable about alpacas and were placed accordingly. 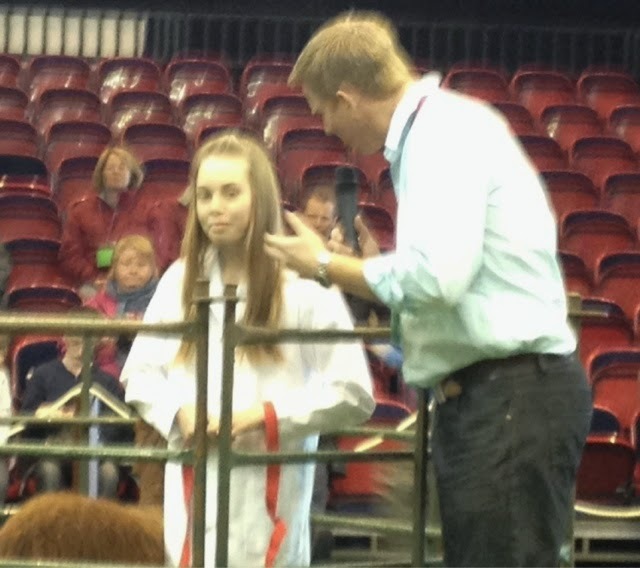 The winner in the older group was Chloe Edwards from Mulberry Alpacas. A lovely diversion and an important one we must encourage every opportunity to get the younger generations involved in our industry and much thanks Tim and Shirley for making it enjoyable for all. What a weekend. 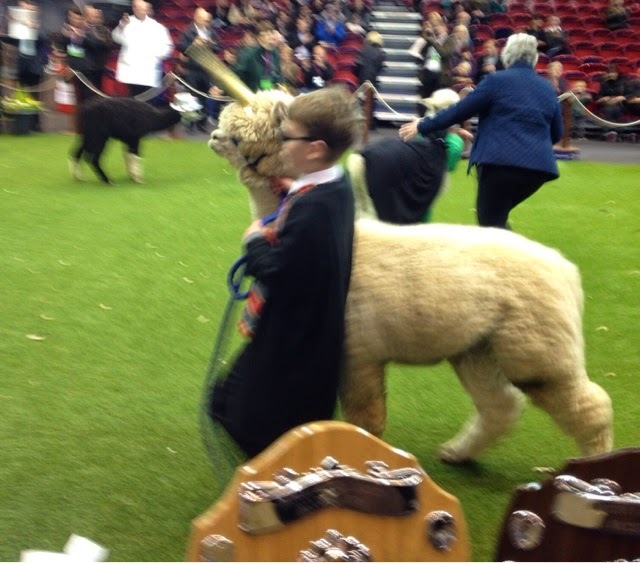 An amazing start to the Alpaca show season for Toft. 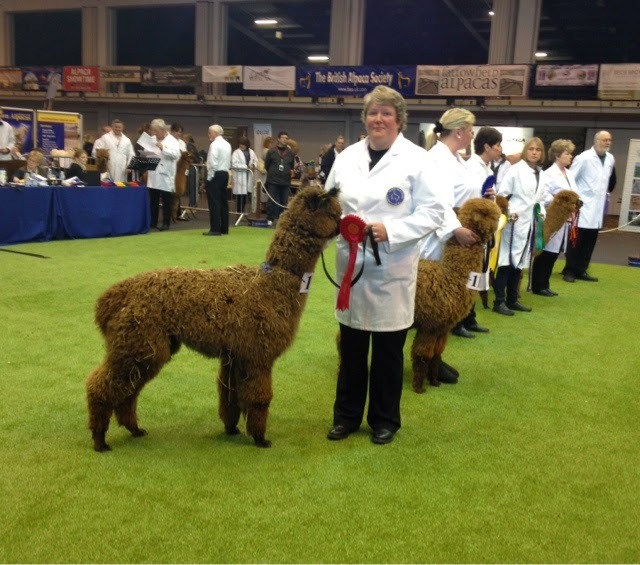 We entered in total seven alpacas to the BAS National show 2014. Six were ours and one was a client's alpaca owned by Snapdragon alpacas and all of them came home with rosettes and three with broad ribbons. 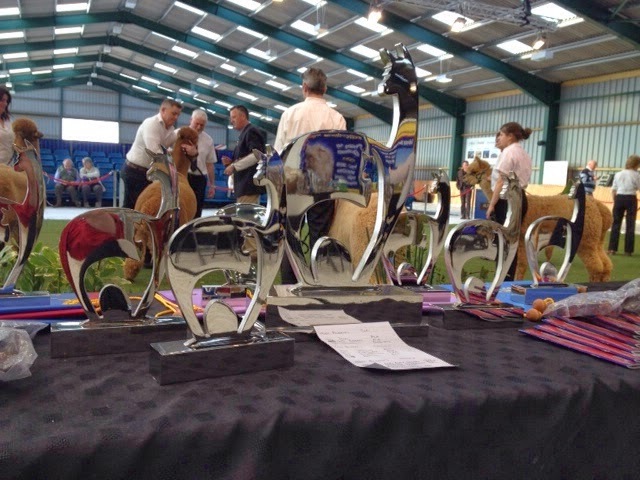 Our six achieved three firsts, one second and a fifth and a sixth rosette and the lovely light fawn female from Snapdragon achieved a first in their first ever show. Wait it gets better. 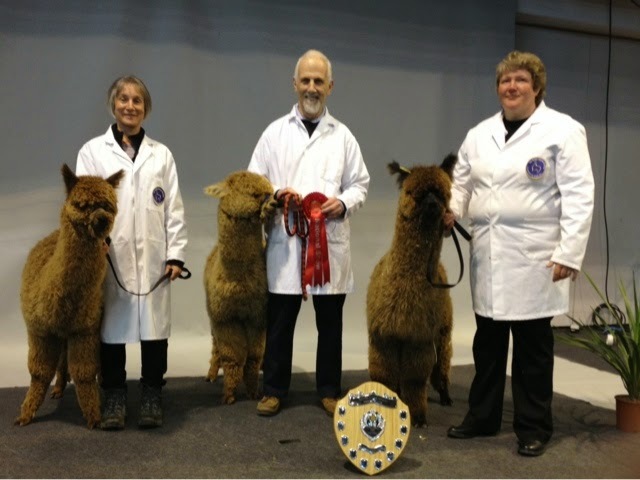 Our entries then went in to achieve a Champion Ribbon and a Reserve Champion and the Snapdragon alpaca achieved a Reserve Champion in her own right. 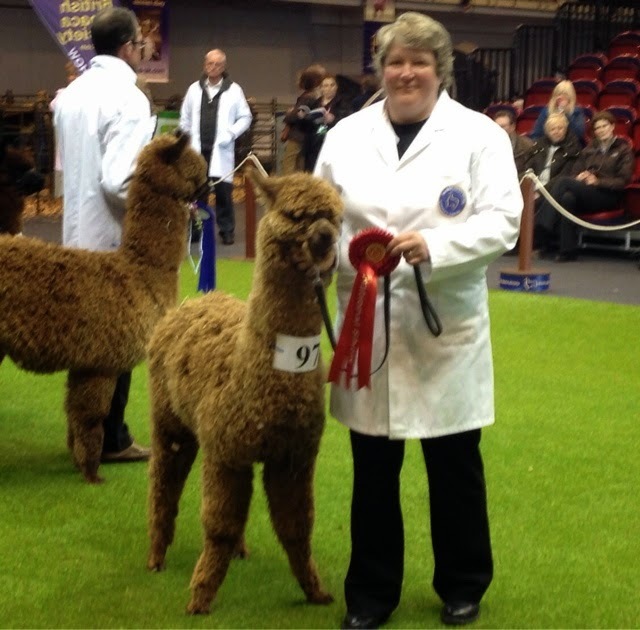 An amazing set of results for Toft Alpacas and the best thing is the alpacas were sired by three separate males- Toft Jaina, Barrbinda Finders Star and Lavender Park Tulley all of whom are resident at Toft. Two of our alpacas were then entered into the Sires Progeny (dark) class alongside one of Ashcroft Alpacas juniors and we brought away the winner shield for them for their stud male Lavender Park Tulley! What a show. Our herds woman Linda was quite emotional especially when Toft. 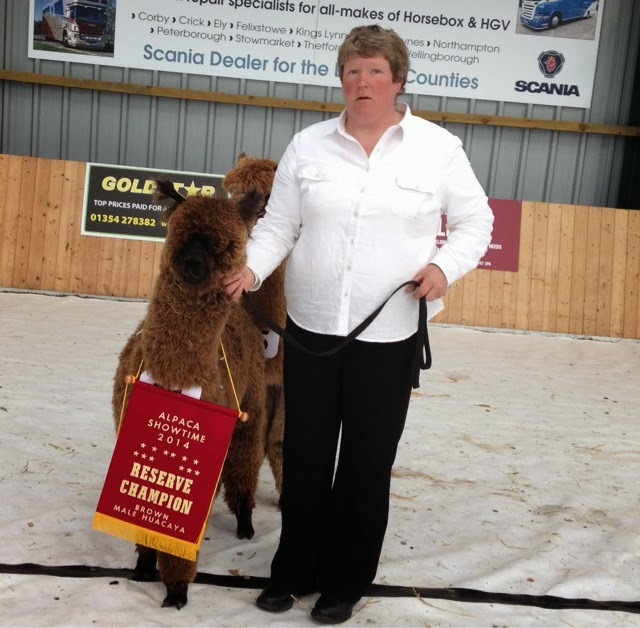 Timogen took the Brown Championship but nothing could beat the grin on Liz Davies face when she won Reserve Champion in her first show with her only entry and she only own two alpacas. She was exstatic and we were overjoyed for them both. Well done Team Toft!! Boots- first in Junior Light Female Huacaya and Reserve Champion Light Female for Liz and Terry Davies of Snapdragon Alpacas. The judges were Jenny Jackson AAA judge from Banksia Park Alpacas Australia and Nick Harrington Smith BAS judge from The Alpaca Stud. 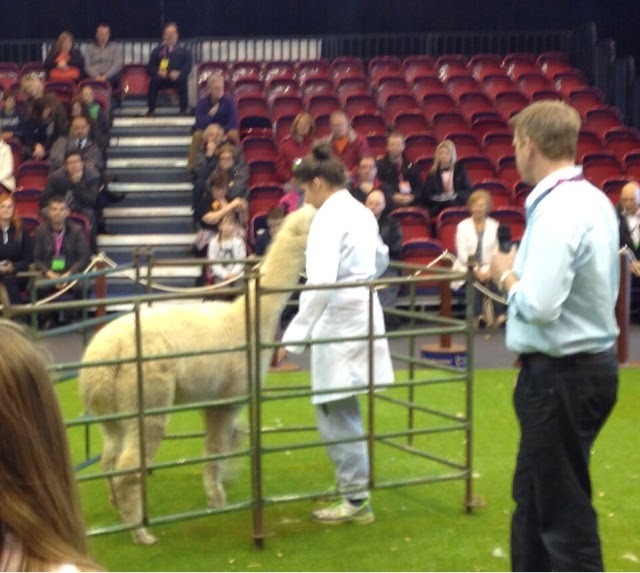 Last Tuesday I had the great pleasure of judging the British Alpaca Society Naional Fleece Show 2014. Organised by Julia Corrigan Stuart of C S Alpacas and hosted on her farm near Aylesbury this was a master class of efficiency and organisation. I was judging the darks and whites with Mary Jo Smith judging the Suris, lights and Fawn. With about 140 fleeces to get through in total we started at the crack of sparrows and finished around 6pm with time to spare. A credit to Julia's organisation and her team of helpers who kept the process moving with their enthusiasm and sense of humour. The standard of fleeces at the top end was very high considering that shearing does not commence for another two months and most of last years clip is now adorning someone's knitting needles! 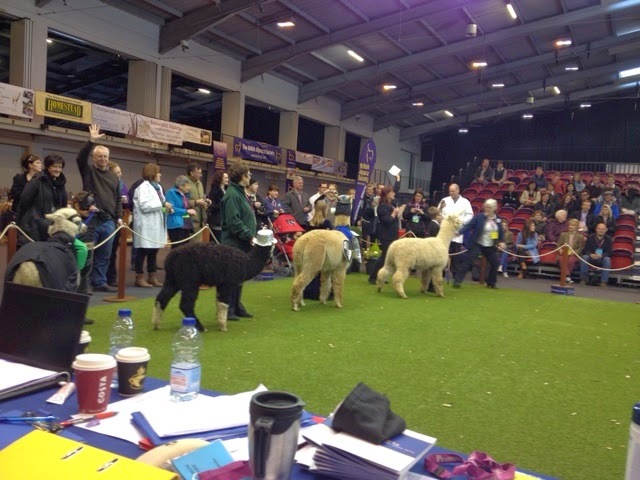 The Supreme Champion Huacaya fleece was simply superb in its positive traits and it's consistency and with 2.8 kg of uniform fibre in dense and beautifully structured locks on the table it was a clear winner with 92 points. The alpaca was Houghton Hall Damian owned by Mick & Liz George of Houghton Hall Alpacas. 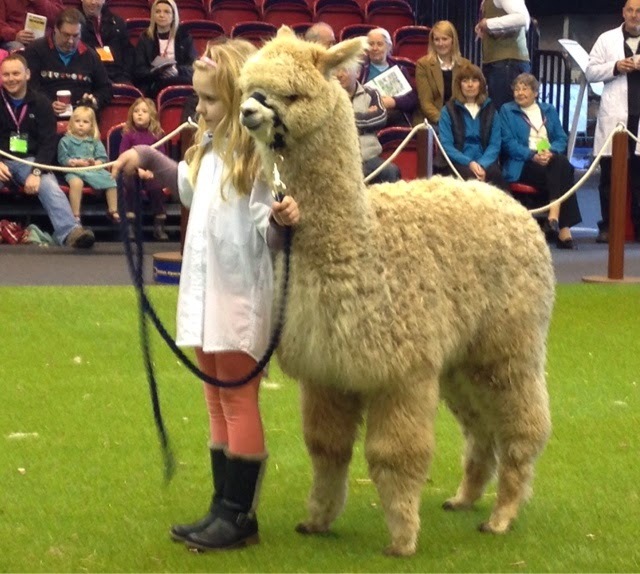 The Supreme Champion Suri was a beautifully fine and lustrous fleece from Alpaca Stud Commander owned by Mr Nick Harrington Smith. Congratulations to both winners and much thanks to Julia and her merry team of helpers. And thanks to Jamie Corrigan Stuart, Julia's husband for his support and generous hospitality. 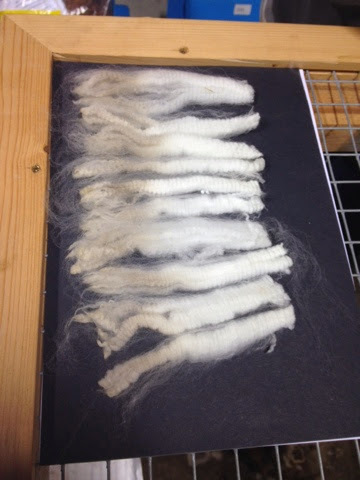 I attach a picture of Houghton Hall Damian's samples- a more uniform batch I haven't seen since I judged the World Alpaca Alpaca Conference Fleece Show 2012. The bad news is he has been sold to Norway! Tilt! Toft Alpacas is expanding. We've taken on another 14 acres of ground adjacent to our holding. Unfortunately it hasn't had a lot on it in the past eight years we know of. Which means there is hardly a fence worth having and the hedges are ten yards into the paddocks at some point. After a reasonable week last week the cutting back of hedges has another couple of days to run before we get it Ll cut back to the old fenceline. 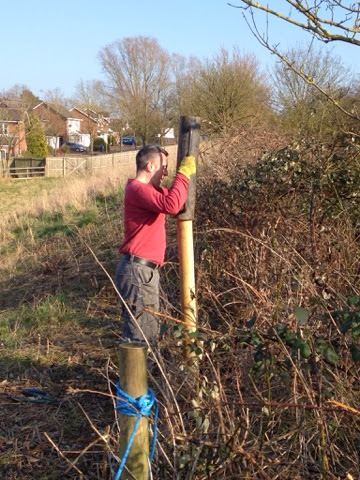 Then of course there's the fencing to replace. 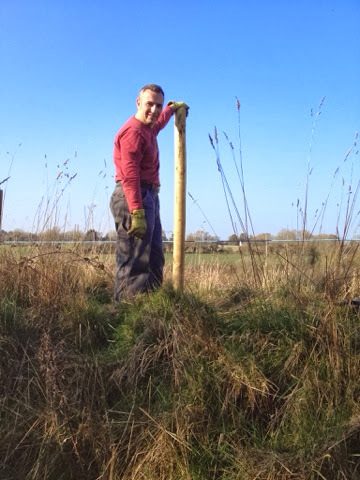 Paul Beswick of Du Prem came over yesterday to give me hand fencing in some waste ground in one of the paddocks. The upside is we got what needed to be done, done. The downside is there's about another 20 days of fencing to accomplish. At least Mr Beswick has plenty of stamina. We were still at it as the light came down. Well, what else is a boy up do on his days off?